Joanne Yew, Temasek Life Sciences Laboratory and National University of Singapore, Department of Biological Sciences, Singapore. Insects such as flies, ants and mosquitoes express species-specific blends of cuticular hydrocarbons (CHCs) on their surface that serve as pheromones and play an important role in their behavior and communication. In view of growing interest and importance of this research area recently several advanced tools were developed for improved CHCs analysis. However, one major limitation of these methods and instrumentations is that alkanes cannot be properly detected via some of the atmospheric pressure ionization ion sources while in standard electron ionization as used with GC-MS the molecular ion is often very weak or altogether missing thereby proper identification is hindered. Furthermore, standard GC-MS is limited to relatively small compounds up to about C40-C44. Thus, we explored the chemical structure of fly and mosquito waxes with the Aviv Analytical 5975-SMB GC-MS with Cold EI which significantly enhances the molecular ion abundances, amplifies and exposes isomer structural mass spectral effects and enables the elution of much larger hydrocarbons via the use of short columns with high column flow rates. In addition, it provides uniform response for accurate quantification of the waxes compounds which is superior to standard EI and in contrast to API ionization methods (APCI, DART MALDI etc). For further information on GC-MS with Cold EI please read the review article A. Amirav, A. Gordin, M. Poliak, T. Alon and A. B. Fialkov "Gas Chromatography Mass Spectrometry with Supersonic Molecular Beams" J. Mass. Spectrom. 43, 141-163 (2008)., which is available on request. In this post we report on the analysis of two fly samples. A) Male Drosophila melanogaster, and B) Male Drosophila mojavensis. 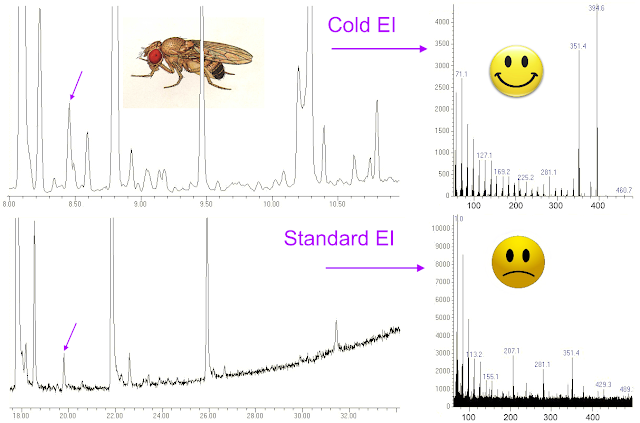 Keep reading how the 5975-SMB GC-MS with Cold EI drastically improves flies cuticular hydrocarbons analysis and bring novel tools for its characterization. System: Aviv Analytical 5975-SMB GC-MS with Cold EI which is based on the combination of Agilent 5975 MSD with the Aviv Analytical Supersonic GC-MS technology (GC-MS with supersonic molecular beam interface and its unique fly-through Cold EI ion source). Samples: The samples were received in empty vials that each contained around 10-20 micrograms of the fly waxes. It was diluted with 100 µL hexane and injected as is. Injector: 250ºC injector temperatures with Pulsed Split or Pulsed Splitless injection at 50 PSIG (25 ml/min). He column flow rate: 2 ml/min with flow program after 12 minutes to 12 ml/min at 4 ml/min.min. On column wax amount: estimated at the 50-100 ng range. GC Oven: 80ºC followed by 20ºC/min to 330C and wait 5.5 min for total of 18 min. Cold EI Ion Source: 12 mA emission, 700 mBar nozzle backing pressure, 60 ml/min total He flow rate (column plus make up at 250C transfer line temperature). Mass Spectral range: 50-800 amu at 2 Hz scan rate. Standard EI system: Shimadzu QP2010 Plus GC-MS with 30 m column with 1 ml/min helium column flow rate. Dominant or highly abundant molecular ions were observed for all the flies hydrocarbon compounds, in sharp contrast to standard EI. Clear isomer mass spectral effects were observed via isomer related high mass fragments that enabled the elucidation of the isomers structures. 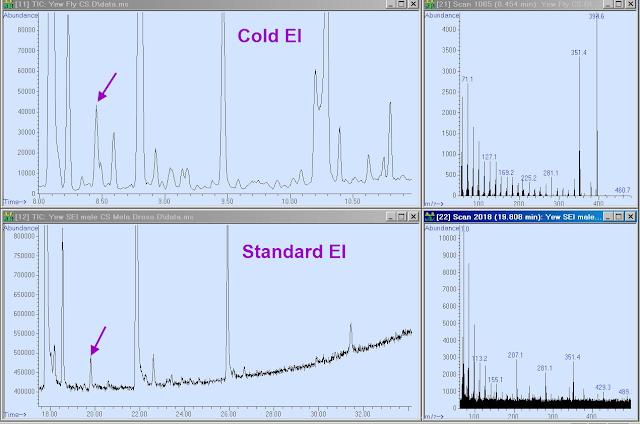 Free acids were observed and identified with Cold EI in the two samples while they were missing in standard EI (of male D. Melanogaster), probably due to standard EI ion source tailing and acid reactions with the ion source metallic surface. 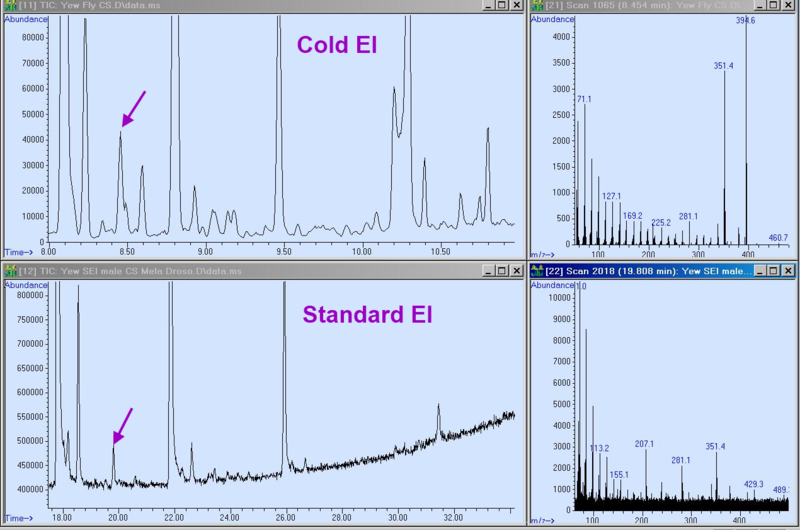 The 5975-SMB GC-MS with Cold EI exhibited much lower limits of identification hence helped in the identification of minor compounds that could not be identified with standard EI. The significantly lower limits of identification emerged from three main reasons: a) the Cold EI TIC signal to noise ratio was superior to that of standard EI despite the fact that its injected amount was a third of the standard EI injection; b) at a given signal the availability of dominant or abundant molecular ions and high mass fragments significantly lowered the limits of identification. Please read more on the degree of molecular ion enhancement in Cold EI in our previous post; c) the use of short column with 2 ml/min column flow rate lowered the elution temperatures thereby reduced the column bleed interference. The significantly lower limit of identification enabled more than doubled number of fly wax compounds that could be identified in comparison with standard EI and also revealed a few errors in compounds identification via standard EI. The use of short column (8.5 m) ensured that all the wax sample compounds eluted from the column. The penalty was twice lower GC separation. The analysis took only 18 min, which is about twice faster than with the standard GC-MS analysis. The 5975-SMB GC-MS with Cold EI uniquely exhibits uniform response to all the wax compounds thereby as with GC-FID enables quantitative analysis of the wax composition. This is a distinct advantage over MALDI and all the atmospheric pressure ionization methods such as DART and DESI. 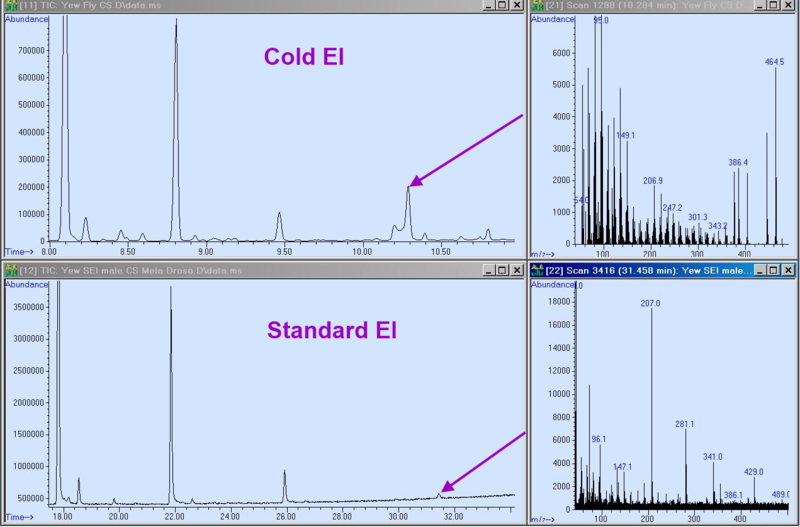 The 5975-SMB GC-MS with Cold EI opens the door for a unique and highly effective isomer distribution analysis characterization of the waxes. This new procedure of data analysis with RSIM on the molecular ions is unique to Cold EI and can serve for species and cryptic species characterization. In the analysis of male Drosophila Melanogaster fly wax we found a reasonably large peak of vaccenyl acetate (the peak at 6.16 min in Figure 1 below) which acts as a pheromone in Drosophila. It showed abundant molecular ion m/z=310.3. 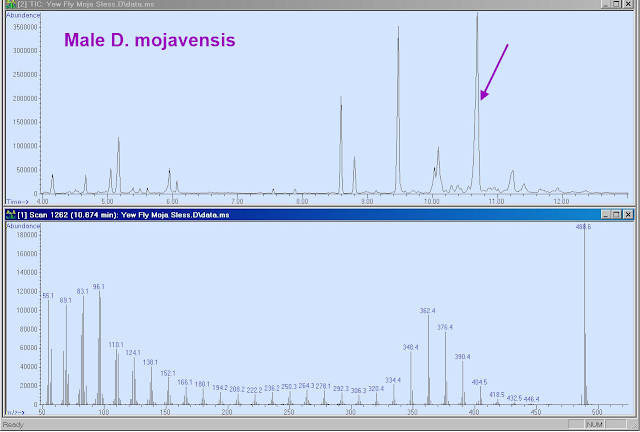 In addition, at the high time shoulder of this peak we found another compound with molecular ion of m/z=308.3. This additional molecular ion is probably of C22H44 olefin isomer but possibly of a vaccenyl acetate related compound with two double bonds. The second option although less likely is interesting as it can be a compound with pheromone activity that colelutes with the vaccenyl acetate thus was not found up to now. We believe that Cold EI is currently the most informative ion source available for the analysis of cuticular hydrocarbons, pheromones and lipids from living insects. Thus, it can serve as a step forward towards comprehensive hydrocarbon analysis and for advance entomology research. Further information is given in the figures and their captions below. Figure 1. Mass chromatogram (TIC upper trace) of male Drosophila melanogaster fly, and a representative cold EI mass spectrum of the peak at 8.8 min that is indicated by the arrow (bottom trace). Note the dominant molecular ion m/z=408.5 of this C29H60 hydrocarbon and its abundant M-15 and M-43 fragments which unambiguously imply that this is an isomer 4 methyl C28 branched hydrocarbon. In contrast, the analysis of this same compound by standard GC-MS was previously erroneously interpreted as 2 methyl C26 since no molecular ion was observed. Click on Image to Enlarge. Figure 2. 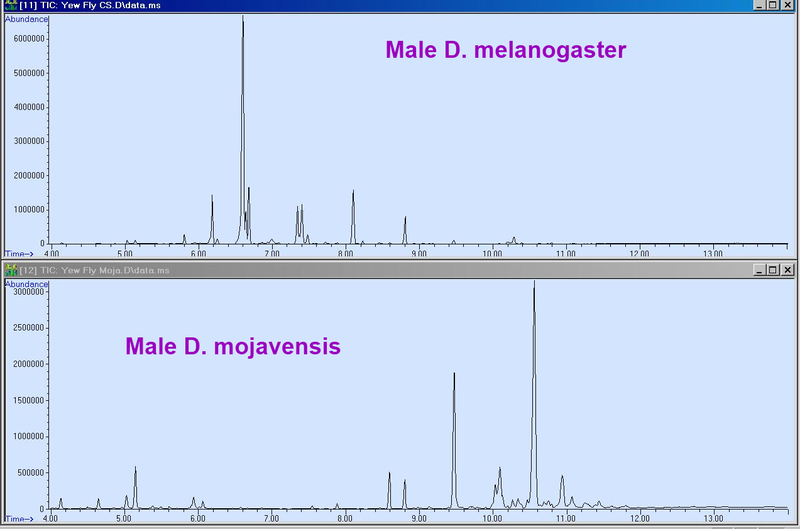 Mass chromatogram (TIC) of male Drosophila melanogaster fly (upper trace) and male Drosophila mojavensis fly (bottom trace), using the Aviv Analytical 5975-SMB GC-MS with Cold EI. Note the clearly observed major hydrocarbon differences in the chromatographic patterns. Probably the Mojavensis adopted itself to a hotter climate thus uses heavier hydrocarbons. Click on Image to Enlarge. Figure 3. 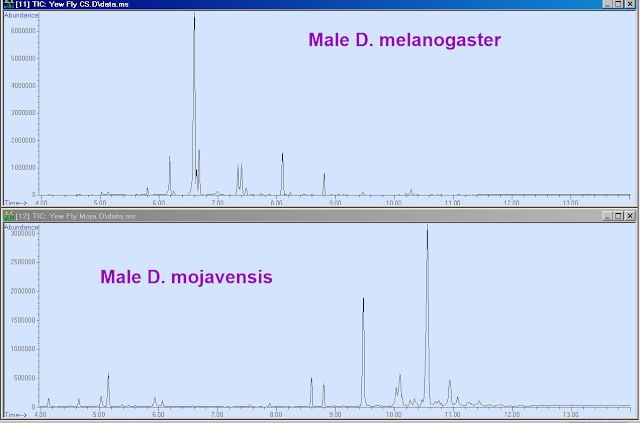 A comparison between Mass Chromatograms (TIC) of male Drosophila melanogaster fly obtained with the Aviv Analytical 5975-SMB GC-MS with Cold EI (upper traces) and with a Shimadzu QP 2010 Plus GC-MS with standard EI, presented at the end of the chromatogram. We used 8.5 m column hence the GC separation is about twice lower since we aimed at improved ability to analyze large compounds. Note that with cold EI the sensitivity is superior and that many more small peaks are observed. Most importantly is the fact that on the two last peaks standard EI failed in the identification as the mass spectrum is dominated by column bleed (last peak at 31.46 min) and void from molecular ions. 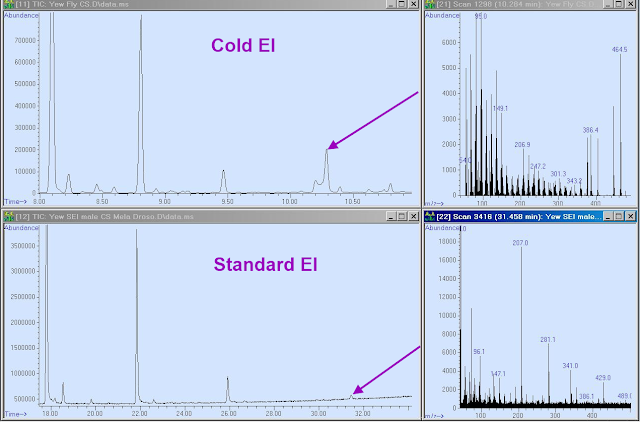 In contrast, with Cold EI we were able to elute and identify a group of four isomers of C33H68 and in their Cold EI mass spectrum (upper right trace, 10.3 min) abundant molecular ion and a few structurally important high mass fragments are shown. 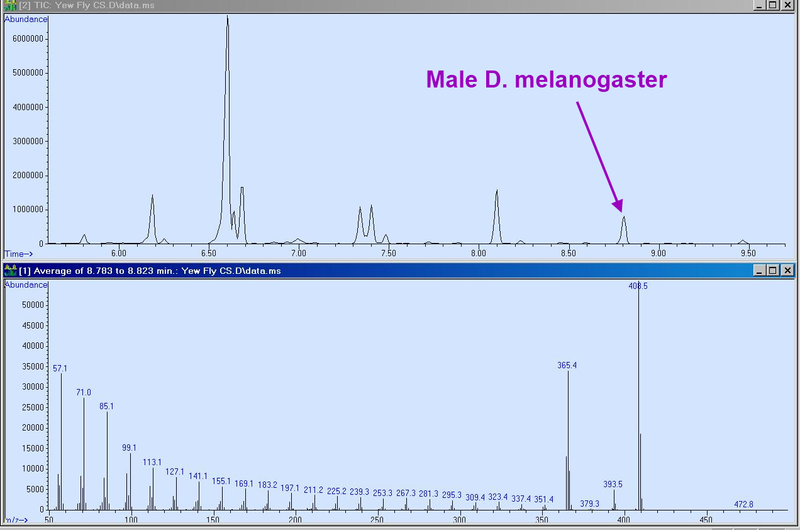 Clearly the Aviv Analytical 5975-SMB GC-MS with Cold EI brings much further identification information. Click on Image to Enlarge. Figure 4. 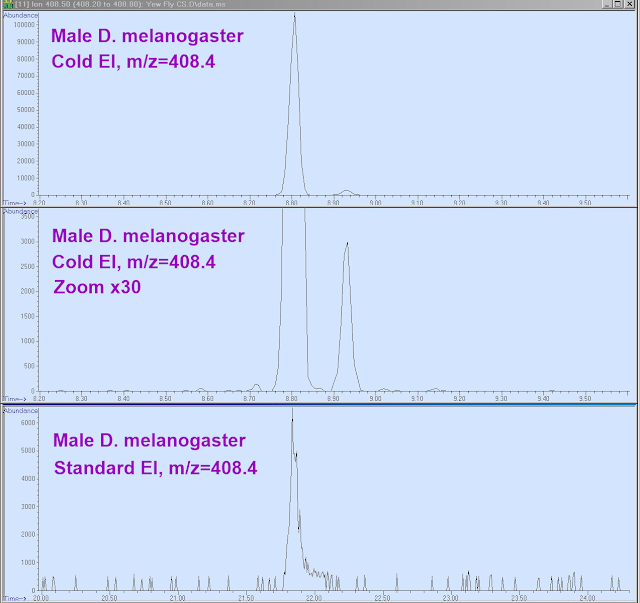 A comparison between zoomed x10 Mass Chromatograms (TIC) of male Drosophila melanogaster fly obtained with the Aviv Analytical 5975-SMB GC-MS with Cold EI (upper traces) and with a Shimadzu QP 2010 Plus GC-MS with standard EI (bottom trace). Note that with cold EI the TIC sensitivity (S/N) is much (orders of magnitude) better and that many more small peaks are observed. Furthermore, in view of the availability of molecular ions and high mass fragments in Cold EI each of these small peaks can be potentially identified. An example is given in the GC peak at 8.45 min in Cold EI and 19.8 min in standard EI (both are indicated by arrows). From the Cold EI MS the identification is clear and easy as 4 methyl C27 while it cannot be identified via the standard EI MS. Click on Image to Enlarge. Figure 5. 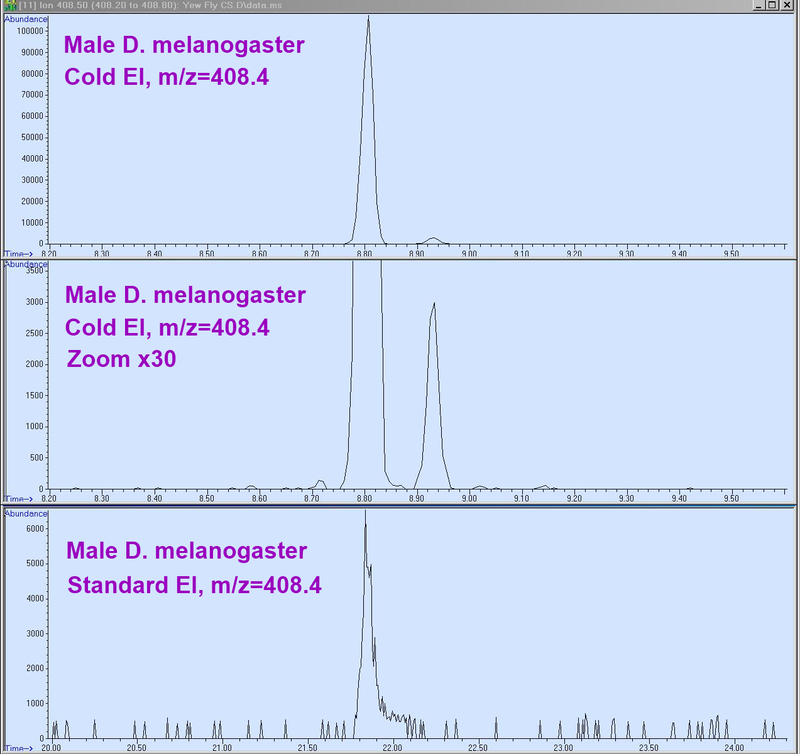 Sensitivity comparison between the 5975-SMB GC-MS with Cold EI and Shimadzu QP 2010 Plus standard GC-MS on the RSIM trace with m/z=408.4 of the C29H60 hydrocarbon of male Drosophila melanogaster fly. As clearly observed, even for the thirty times magnified trace the noise is much lower with Cold EI and the superior signal to noise ratio leads into the clear observation of a second RSIM peak which is fully absent in standard EI. Software based signal to noise ratio measurement shows that Cold EI has over 500 times lower LOD than standard EI for this m/z=408.4 RSIM trace despite its three times lower injected amount. Note also that while the standard EI peak is tailing this tailing is fully eliminated in Cold EI. Click on Image to Enlarge. Figure 6. 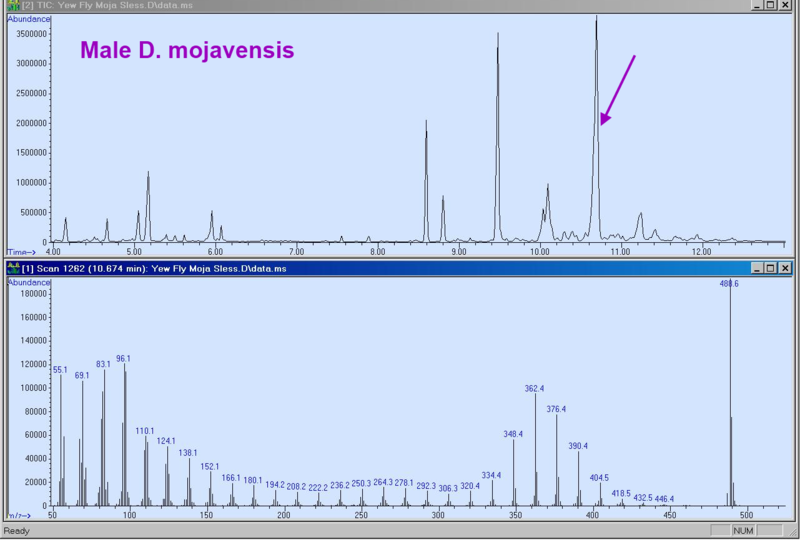 Mass chromatogram (TIC upper trace) of male Drosophila mojavensis fly, and a representative cold EI mass spectrum of the peak at 10.67 min (bottom trace) which is of its most abundant compound. Note the dominant molecular ion m/z=488.5 of this potentially C35H68 unsaturated hydrocarbon with two double bonds. We note that at the early elution time shoulder of this peak there is a compound with m/z=490 molecular ion, that we assume is the singly unsaturated hydrocarbon. This compound which is the most dominant compound in the D. mojavensis fly wax is absent in the D. melanogaster fly and thus can perhaps serve as a marker of the D. mojavensis fly. Click on Image to Enlarge.